Enterprises seek infrastructure solutions that evolve with changing needs. WAN Edge Infrastructure has moved away from traditional hardware implementations, paving the way for software-defined versions that are highly scalable, resilient, flexible, and simply managed. VMware drives to provide a solution that delivers all these requirements with an endless runway for future developments and as a result the company has been recognized as a leader in the SD-WAN space. 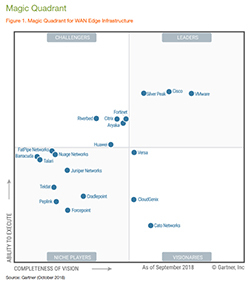 Get the 2018 Gartner Magic Quadrant for WAN Edge Infrastructure report to read about why VMware is named a LEADER based on completeness of vision and strong ability to execute.